Short cuff gloves for winter with Drystar Performance for maximum feel. 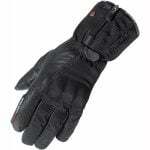 Short cuff winter riding gloves: Drystar performance offers waterproofing in the wet weather, the membrane is laminated to the outer to stop water settling in between the leather and the membrane as other gloves may do. Winter motorcycle gloves with 100g Thinsulate lining to the back of the hand, which is the area that suffers most from wind-chill. Great comfort and protection. A short cuff pair of gloves may seem like the odd choice for winter riding, but they're with good reason. Many motorcycle jackets now incorporate cuffs that battle the elements or use a lot of tabs to ensure a secure fit that stops wind flow, these fit neatly underneath the sleeves, with no excess fabric. A good moulded hard knuckle offers protection and the palm uses goatskin leather offering grip and abrasion resistance in the event of slide. "Nice and comfy. Keep your hands nice and dry. Not the warmest but with grips on low heat I have no issues. Measure your hands though and size up if in-between."